How Did I Get This Shot? Call it a mistake from being temporarily obsessed with HDR photography. I was sitting at my job with my travel hard drive, finished with all my design work and instructional help, and so I decided I wanted to see if I could do an HDR photo using the photos I already had . . . because I was not going to be let out of work to take photos. 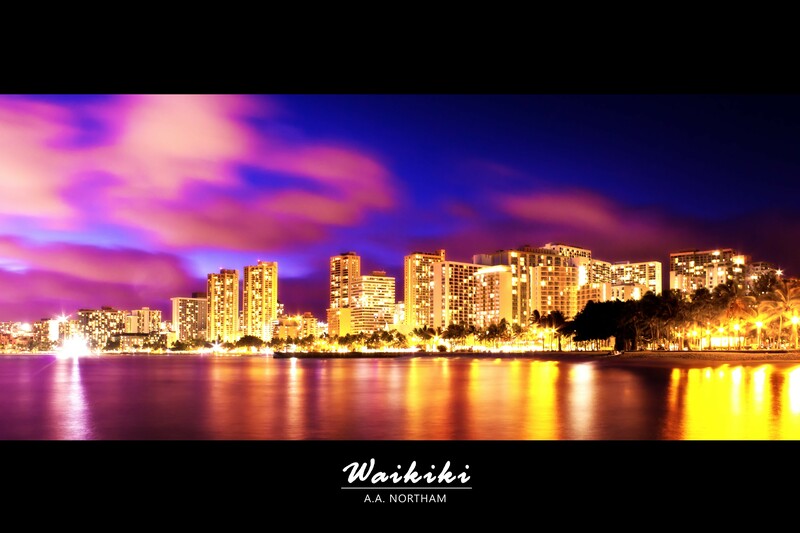 I sifted through my old photos and came across an older one I had shot of the Waikiki skyline at night. My plan was to use Photoshop to underexpose the shot and overexpose it and then combine the three resulting images to create an HDR photo. After my first attempt, I realized this was not going to work well. So I settled for simply messing around with Photoshop while at work. After a few careless edits, I managed to get the shot above. It is almost unrecognizable from the original shot, which, was already quite pretty. This is definitely more my style though. Bright colors, soft transitions, and tons of contrast are typical of my paintings. But even I was a bit astonished with what I was able to do with this photo and Photoshop. For people interested in knowing how to do this, you will need CS5 or higher and a standalone or plug-in for Imagenomic’s Noiseware (I used the standalone version). I began with my typical edits adjusting contrast and tone and then using transform to make sure the city skyline was de-skewed. Then I put the image through the HDR Toning Filter, keeping the effect very, very slight. Now, if you have used the HDR Toning Filter, you know that this can often leave unwanted noise on the photo. I hate noise. But I do love Gaussian blurs, so I created a duplicate layer and applied a pretty hefty blur. Then I reduced the opacity and created a mask to keep the buildings nice and crisp. This was okay, but it was not exactly what I wanted, so I selected a layer “type” and instead of using “Normal” (the default), I selected overlay. My coworker told me she was almost immediately blinded. The overlay darkens and brightens colors in a pretty nice way, and I think I may have discovered my new favorite way to edit landscapes. When I saw the photo, I knew it was exactly what I wanted. Still, the image was not perfect. The overlay blurred the noise left behind by the HDR Toning, but it still was a bit too grainy for me. I had been researching Photoshop plug-ins earlier in the week, and that was when I came across Imagenomic’s website. They have three pretty nice plug-ins, the two I like the most being Portraiture and Noiseware. To be honest, I was pretty sold on Imagenomic’s plug-ins before using them, but they let you download the Noiseware plug-in for free as a trial, so I decided to try it out. I was not disappointed. Noiseware got rid of all that terrible noise in my photo and really made it shine like how I wanted it to. After that, I bought Noiseware for my mobile device and plan to buy the standalone software as soon as my trial period is up. I strongly recommend this software for anyone interested in cleaning up their grainy images. It really does an amazing job! I also tried out Imagenomic’s Portraiture and was equally amazed. These are both definite musts for photographers!